In only the second edition of the Clubs Cup, coming back after a six year hiatus, We are guaranteed a new champions this coming Sunday as current holder Balwyn Futsal Club fell at the first hurdle. This Sunday’s final pits back to back Series Futsal Victoria champions Carlton Heart against the Fitzroy Tigers who have turned their season around after looking certain to partake in a relegation playoff early in the season. The sides met most recently in the last played round of Series Futsal Victoria (Round 17) and if that spectacle was anything to go by we are in for a treat in the final. Below we provide all the information you need to know about the two sides in what is sure to be a mouthwatering contest. * It is clear that the Heart have been the best side in victory for over twelve months now and have the wood over the Tigers but in a final anything can happen, thought the Heart will go into the game as the favourites to take home another piece of silverware. Round 4 – Carlton Heart 4-3 Melbourne Athletic FC – The Heart were on the brink of elimination in their opening match of the competition, despite being heavily depleted it took a captain’s performance from Chaaban Rajab to claw his side over a galant Melbourne Athletic outfit, who pushed victoria’s best to extra time but fell just short as Carlton did just enough to progress. Quarter Finals – Carlton Heart 7-3 Western Wolves FC – An ever growing rivalry was resumed when the Heart faced the Wolves in the Quarter Finals. Always a physical affair, Carlton got the jump early and never looked back as they cruised to victory on this day. Atay Ibrahim the star of the show returning from injury to guide his side into the semi finals. Semi Finals – Carlton Heart 6-5 Hume FC – Another tough game awaited the Heart in the Semi Finals as they took on an in form Hume side. Carlton had their backs against the walls at the half time break as they trailed 2-0, but looked a rejuvenated outfit in the second half as they piled on five goals to one, before Hume got a few late ones back to ensure it would be a nervy few moments, but Carlton prevailed with Atay Ibrahim and Chaaban Rajab the stars of their first two clashes inspiring the comeback and ensuring the Heart would reach their first Clubs Cup final. Round 4 – Fitzroy FC 9-3 Glen Waverley FC – The Tigers kicked off their campaign against the bottom side of the State League Championship at the time in Glen Waverley. After some early resistance from their opponents, the Tigers overran their rivals to record a 9-3 victory. An even spread of goal scorers as well as the youth getting some good minutes in but Cosimo Russo was the standout as he bagged himself a hat trick. Quarter Finals – Fitzroy FC 1-0 CF Brunswick – The quarter final saw the Tigers face SFV opposition in the form of Brunswick. In what was an entertaining game with plenty of chances for both sides, Fitzroy edged their opponents through a Llewellyn Stone goal which saw them progress to the Semi Finals. Semi Finals – Fitzroy FC 5-3 Pascoe Vale FC – El Classico in the semi finals of a cup. Its something we’ve seen many times before and is always an action packed encounter. Pascoe Vale got the jump on their rivals early as they got out to a 2-0 lead at the half time break. Much like Carlton though Fitzroy turned the tide of the contest, and were level after just four minutes of play thanks to goals from Scott Rogan & Llewellyn Stone. Rogan would strike again shortly after to give his side the lead, only for Andre Caro to pull out an incredible finish and send the game to extra time. The Tigers regained the lead in the first half of extra time through a Corey Sewell wonder goal, and the job was done as Cosimo Russo iced the game and sent Fitzroy to their first ever Clubs Cup Finals. It is so difficult to single out a handful of players as anyone in either side can have a huge impact on the game but we have singled out three players from each side who can turn the tide of the game. Chaaban Rajab – A man for the big occasion the Carlton captain lives for the big games and will be instrumental as ever in locking out the Fitzroy attackers, his pace and defensive smarts will prove pivotal again in a Carlton victory. Arturo Garzon – Garzon was suspended for five weeks recently and Carlton definitely missed his presence in the team. A workhorse in defence and the creative spark in attack, If Garzon has half the game he had in the last meeting between these two sides it will go a long way towards a Carlton victory. Ernie Simsek – Returning from injury just last week, Ernie Simsek had an immediate effect on his side, as he broke the deadlock between these two last Friday and has played many big finals in his time, always popping up with important goals when needed. If the game is on a knifes-edge you can bet your house the Ernie Simsek will step up and deliver for the Heart. Scott Rogan – At the young age of just nineteen Scott Rogan is among the leagues elite players and is the man who makes the Fitzroy engine tick. Lightning quick and solid in both offence and defence, if Rogan can find the form which saw him awarded the 2017 Series Futsal Australia MVP it will go a long way to the Tigers taking home the trophy. Cosimo Russo – One of the form players of the competition at the moment, Cosimo Russo has been a huge part of Fitzroy’s revival in the second half of the season, commanding the side from defence and scoring a bag full of goals, if Russo continues his goal scoring exploits we are in for treat. Corey Sewell – Only entering Series Futsal Victoria this season, Corey Sewell has had a huge influence on the Fitzroy side. He has fifteen goals to his name so far this term and if the Tigers are to break their scoring struggles against the Heart they will need a big performance from Sewell. 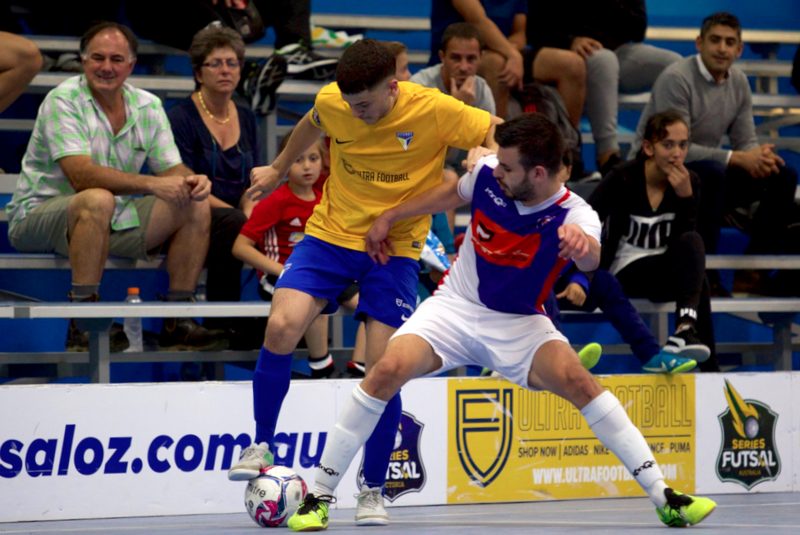 It is sure to be an entertaining encounter, one you will want to be in the Futsal Oz Thomastown Stadium for, but if you can not be present to catch the game live, ensure to tune in to the live stream via the link below.